What Makes The Grill Dome Kamado Different From Other Ceramic Barbecues? Kamado barbecues are becoming more and more popular (and rightly so) but what make the Grill Dome kamado stand out from its rivals? The surface of the Grill Dome kamado is smooth, with the exception of Primo, most others have a dimple effect on the surface. Those with the dimple will tell you that this is more than just an "effect", the dimples actually help prevent cracking during thermal expansion. I have heard stories about the Grill Dome lids being more susceptible to cracking but I must stress that these stories are all third hand, I've not seen direct evidence. The grill dome is a slightly different shape to the other round kamados which translates into a greater height and therefore larger volume in the cooking area. The argument here is that you can get more chickens vertically cooked than in any other round kamado. The top vent operates in a different way. Rather than a daisy wheel, there is a friction fitted vent. It's difficult to explain in writing but it looks a little like a sun dial. Finally, the Grill Dome kamado is available in a number of colours. Great if there is a genuine need but it must play havoc with inventory management. I’ve been cooking on a kamado for a number of years now and I have to say that the results are excellent whether grilling or smoking. A kamado is forgiving in that it is easy to control and the Grill Dome is no different. The Grill Dome (again like all other kamados) is economic on fuel however their claim that it’s ready to cook on in 5 minutes I think is a little optimistic. Speaking from experience I think that the ready to cook claim should be about 15 minutes. Why Buy A Grill Dome? There are an increasing number of kamados on the market now and I guess the Big Green Egg is still the most widely known – and great if you want your grill colored green! It's the same with other top brands, you get the choice of one colour whereas with Grill Dome you get a choice so long as it is in stock. The other benefit of the Grill Dome is the space under the lid but after that it's difficult to find a reason to buy Grill Dome, maybe price in the US is attractive but this certainly doesn't translate in the UK. When comparing prices however you need to be careful to ensure you compare apples with apples. Some manufacturers include and number of parts in the base price, others price them as extras and this can differentiate the price markedly. Also check the availability of the accessories. If the back room support isn't behind the brand then you may just spend a chunk of change on an obsolete barbecue. Grill Dome is a reasonable entry level model to kamado cooking but my choice would be either Monolith or Kamado Joe because I think that these brands deliver the best value for money coupled with a wide range of accessories and after sales support. 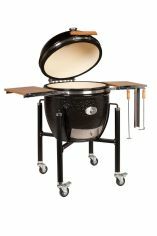 Return to Gas Grill Recipes from What Makes The Grill Dome Kamado Different From Other Ceramic Barbecues?